Cycling holidays are a type of trip which remains popular with people who are looking for something a little more active from their summer vacation. Although many travellers would doubtless rather spend their time off at a beach or a bar, pedalling around not only gives you exercise and fresh air, but also allows you to explore a place at a pace and level which brings fascinating new perspectives. Being mobile also adds a layer of freedom to such a holiday that not many other types share. The key to a good cycling holiday is that you pick a good destination, one that is suitable for not only your interests, but also your fitness levels. While a trip across flat regions of a country like Holland is manageable by many people, a trip to Switzerland or the Pyrenees might not be quite as enjoyable for someone without very high fitness levels. For this reason, it is also important to manage distances correctly. While ten miles will not sound like much to a serious road warrior, it is a very long way for someone who is a little bit older or who does not exercise regularly. As well as keeping an eye on hills and distance, also select the kind of terrain carefully. Mountain bike tourists will expect a much higher level of difficulty when it comes to terrain than road specialists, or simply people who are using cruising bikes to see a bit more of the world. If you are booking with an agency, always check the type of cycling on offer carefully to see what will be expected of riders. Of course, to enjoy a good cycling holiday you also need a bike that works properly and can cope with all the demands placed on it. While experienced cyclists may prefer to take their own bike with them, this is not always practical or affordable for more casual riders. Always check that bikes can be hired at the place you are visiting and make sure that any extra costs that might arise are catered for by having some spare cash on you when you arrive. 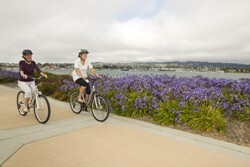 There are a whole range of different types of cycling holiday which can suit a range of people. From simple and short activity weekends to cycling the route of professional road races for a month or so, cycling offers a huge range of possibilities. If you want to do something a bit different then it could be worth dusting down that bike in the garage and seeing just where it might take you.